After his wife died in 1791, John entered a monastery at Saint Petersburg (Saint Herman’s Letter of December 13, 1819) and was tonsured with the name Juvenal. Three years later, he went to Alaska as a missionary. During 1794, the hieromonks Juvenaly and Macarius spent two months in the area around Kodiak teaching the inhabitants about Christ and baptizing them. They traveled in small boats of hide in all sorts of weather, dividing up the territory among themselves. Saint Herman tells of a conversation he heard one day as he walked with the hieromonks to a small hill on the south side of the harbor. They sat down facing the sea, and spoke of various things. Soon they began to discuss where each of them should go to preach. Aflame with zeal and eager to set out on their journey, a friendly argument ensued between Father Macarius and Father Juvenaly. 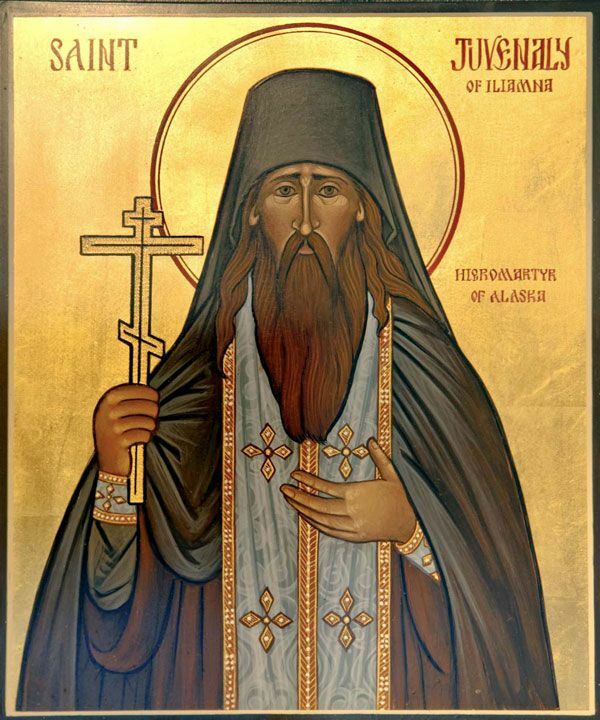 Father Macarius said he intended to go north to the Aleutian Islands, and then make his way to the Alaskan mainland, where the inhabitants had invited him to visit. The monks had a map of Captain Cook’s which indicated that some Russians were living near a certain river in that particular area, and Father Macarius hoped to find them. Father Juvenaly interrupted, saying that he believed that the Alaskan mainland was his territory. “went from joy to rapture” (Letter to Abbot Nazarius, May 19, 1795). In 1795, Father Juvenal baptized over 700 Chugatchi at Nushek, then he crossed Kenai Bay and baptized the local people there. 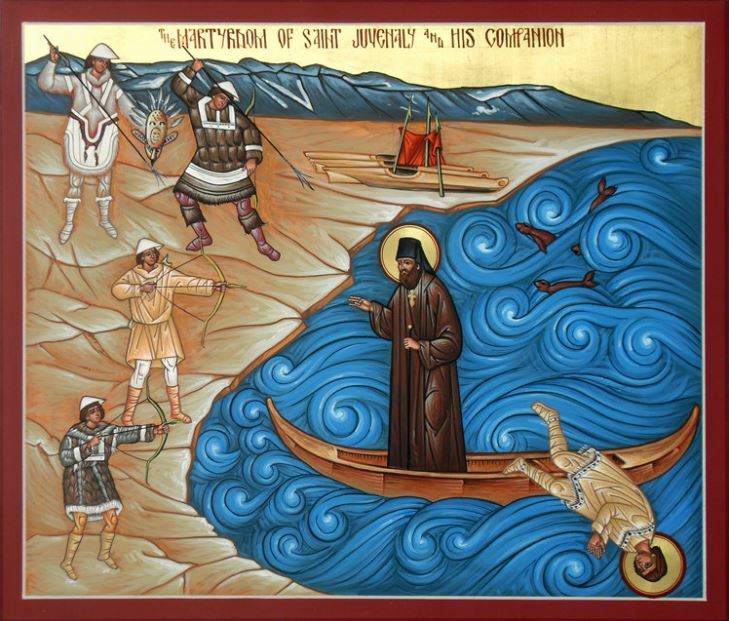 In 1796, according to native oral tradition, Saint Juvenal came to the mouth of the Kuskokwim near the present village of Quinahgak, where he was killed by a hunting party (There is a forged diary attributed to Ivan Petroff which gives a slanderous version of Father Juvenaly’s death, and alleges that he was martyred at Lake Iliamna). The precise reason for Saint Juvenaly’s murder by the natives is not known. However, they later told Saint Innocent something about his death. They said that Saint Juvenaly did not try to defend himself when attacked, nor did he make any attempt to escape. After being struck from behind, he turned to face his attackers, they said he seemed to be swatting flies (making the sign of the Cross) and begged them to spare the natives he had baptized. The natives told Saint Innocent that after they had killed Saint Juvenaly, he got up and followed them, urging them to repent. The fell upon him again and gave him a savage beating. Once more, he got to his feet and called them to repentance. This happened several times, then finally the natives hacked him to pieces. Thus, the zealous Hieromonk Juvenaly became the first Orthodox Christian in America to receive the crown of martyrdom. His unnamed guide, possibly a Tanaina Indian convert, was also martyred at the same time. It is said that a local shaman removed Saint Juvenal’s pectoral cross from his body and attempted to cast a spell. Unexpectedly, the shaman felt himself lifted up. He made three more tries with the same result, then concluded that there was a greater power than his own at work here. He then ordered the bystanders to respect anyone that they saw wearing such an item, and indeed, future missionaries were well received when they visited the area. Years later, a man showed up at the Nushagak Trading Post wearing a pectoral cross exactly like the one worn by Saint Juvenaly. A column of light arose from his holy relics and reached up to Heaven. It is not known how long this phenomenon continued. Saint Juvenal, in his tireless evangelization of the native peoples of Alaska, served the Church more than all the other missionaries combined.